We decided we were going to rip out the carpeting and have hardwood flooring put in. My mother-in-law decided we should just do it, so she gifted us the money for the project. How generous she is. The same day that arrived, a friend called to say she was moving to a smaller house. I had helped her set up a loom she had found several years ago. She called to say that she was gifting me the loom as she wasn’t going to be using it and it was to big for her house. I was stunned. Now we have to get the flooring done so we can find a place to put it. What amazing blessings, both to happen in the same day. I started back to work on Monday. It was a meeting day. Today was a work day where I got paperwork ready and organized the room. I am always anxious this time of year so I hope it all goes well. I got up the courage to play with my embroidery machine this last week. I was able to successfully make some lace snowflakes and butterflies. It is fascinating to watch it sew. I then decided to try to make a crane on a towel for Mom. I enlarged the pattern to 150%. For some reason, it wouldn’t stop for the color changes so it ended up all white. I also put it up too high. 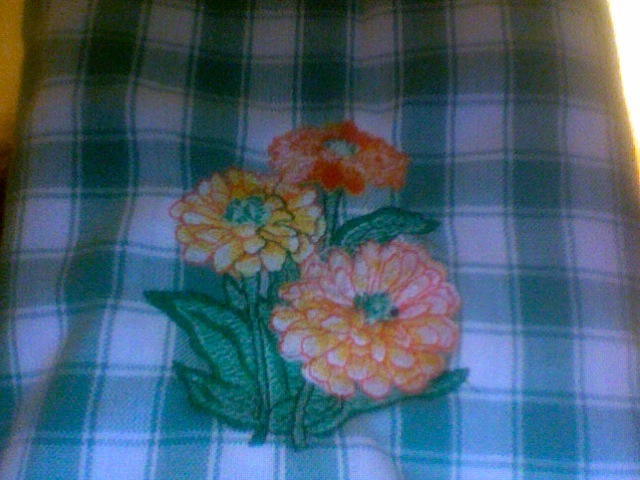 The next one I did was of some flowers on a green and white towel. I turned it on its side. For some reason it also didn’t work right and I ended up with one flower so thick it sewed a hole in the cloth 😦 I am putting it into time out. I have the first guide class tomorrow. I am supposed to learn how to do basic things on the machine. I hope it works……….